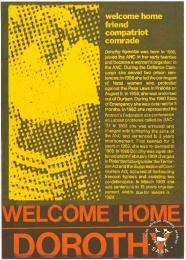 Description: This is an offset litho poster in black, red and yellow, issued by the African National Congress (ANC) in 1984. 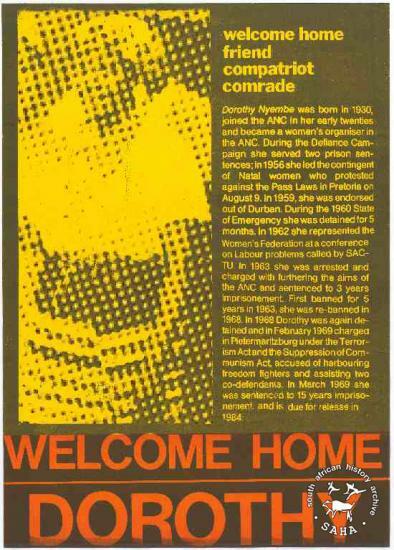 The main text reads: "welcome home friend compatriot comrade : WELCOME HOME DOROTHY". This poster was digitised by Specialised Archival Solutions in 2009. Included in SAHA exhibition kit and virtual exhibition, titled 'Women hold up half the sky: commemorating women in the struggle'.